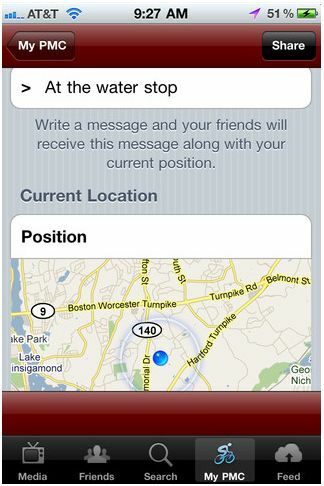 Share your ride experiences and keep track of the weather by downloading WCVB’s app for iPhone and Android. The app features an easy-to-use interface to take photos and immediately upload them to WCVB’s U Local section. All photos taken from the PMC route will be featured on WCVB.com and some will be used on television. WCVB’s interactive radar on mobile will allow you to keep up-to-date on the weather should storms develop. Just search “WCVB” in the app store to find the download. This year, PMCers have all the tools to fundraise and train for the Pan-Massachusetts Challenge in the palm of their hands. The PMC has launched its first fully integrated PMC Mobile App, available on both Apple and Android devices. The PMC App has many features to assist riders and Virtual Riders in preparation for the August event. GPS tracking capabilities allow riders to “check-in” along their training routes to show others where they ride and how far. This function is a great way for PMCers to gather for training rides and keep their supporters informed of their efforts. 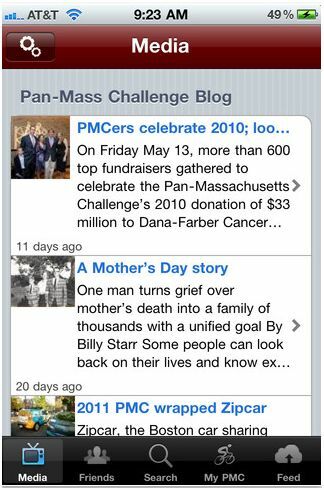 The app enables PMCers to easily view the PMC Blog and follow the stories of other PMCers. Riders and volunteers can update their fundraising status and riding miles logged on Facebook and Twitter, email friends to seek donations, and easily send thank you notes for contributions made. PMCers can use the app as a platform to stay connected year-round with other riders, Virtual Riders and donors in their social networks. The PMC App will expand the PMC community physically and virtually, increasing the number of committed participants and dollars raised. All proceeds from the $1.99 app go directly to Fontana’s PMC fundraising and 100 percent of every rider raised dollar goes directly to Dana-Farber. To download the PMC App visit the iTunes store or Android market.